Futures Gold comes at you like a slap around the face and opens with the immortal line, “HEY! I’m pleased to meet you / and all your stupid faces”. Relentless in its tempo and urgency, The Late Greats blend an apparent love of lo-fi US indie/alt-rock (Sonic Youth, Pixies, Pavement) with a truly English delivery, glittering with melodic gold. The City Swallowed You Whole is another slice of immense energy, with its chest rattling moog bass line and the sweetly resigned chorus “The city has ways, off wearing us down / “The city has ways of stealing our crown”. This is the rallying cry off the small town underdog, about to be let off the lease. Touring and gigging over the last year with the likes of Late of the Pier, Blood Red Shoes, Hot Club de Paris and Howling Bells has developed The Late Greats into an incredibly tight and thrilling live band. Co-vocalists Max Arnold and Ryan Griffiths compliment each other perfectly: Max is assured and confident, while Ryan huffs, puffs, shouts and stamps like a man possessed. 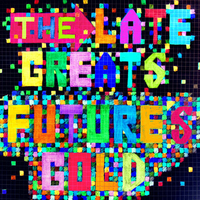 Unfortunately at this time we can't offer all the The Late Greats - Futures Gold tracks as individual mp3s, as some of these tracks exceed the shops maximum (9mins) download length.